Weapon Stats & Strategy for Thermal Scoped Assault Rifle in Fortnite. 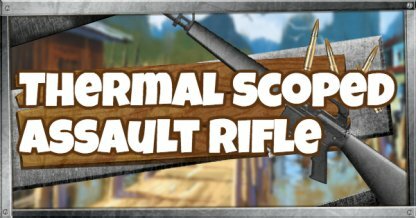 Read here to find information about the damage(DPS), rarity, and reviews for Thermal Scoped Assault Rifle! 36 36 15 64.8 2.2sec. 37 37 15 66.6 2.1sec. Check out the All Assault Rifle stats List! The Thermal Scoped Assault Rifle gives players the ability to see heat signatures even behind cover. It makes recon easier but due to its average damage, it does not perform well without the backup of teammates. What makes the Thermal Scoped Assault Rifle unique is its ability to show enemy heat signature, chests, and supply drops. This is helpful when it comes to checking for enemies before rushing in. As a hit scan, the Thermal Scoped Assault Rifle is more forgiving when it comes to landing shots from a distance. As long as the enemy is aligned with the crosshair, the shot will connect. The Thermal Scoped Rifle has average damage output per shot. It would take at least 3 successful shots to take out a the full shield of an enemy. Take advantage of its Thermal Scope. Use it to check locations before entering. In Squads, you can use it to callout enemies to allies and work accordingly to take them out. Mitigate the lack of damage of the Thermal Scope Assault Rifle by shifting to a sniper rifle after checking enemy location. No need to adjust the angle of shooting as the Thermal Scoped Assault Rifle has no bullet dropoff.